In January 2019, MSC Missions Office Director Fr Michael O’Connell spent three weeks in Venezuela, visiting MSC parishes in the cities of Maracaibo and Caracas. Here, he shares his experiences and his thoughts on a country in crisis. 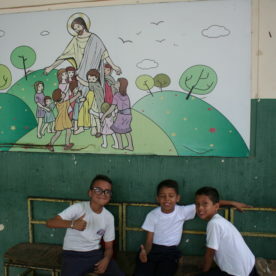 “The Our Lady of the Sacred Heart School in Maracaibo currently has approximately 850 to 900 students, from infants right up to teenagers. Of these students, only 300 are registered on the government official registration site at the moment, as the government only opens up registration every so often. Therefore, it’s a slow process, but the school are very confident that it will be done. The government has introduced a day for teachers, but this year, they didn’t have a big celebration; in the current climate of hunger and poverty, there isn’t much to share. The municipality has asked every school to name a Teacher of the Year and to give them a present. The teachers here asked Fr Vincent Screene MSC for some money so they could buy a present for the Teacher of the Year. 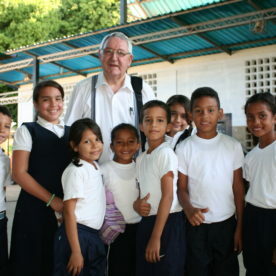 Fr Michael visits students of MSC and OLSH-run schools in Maracaibo. 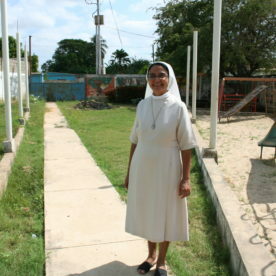 The head teacher at the school is paid a total of 5,200 bolívars a fortnight. She is the head teacher at a school of over 850 children and approximately 45 staff. She has a university degree and a Masters, and her total pay is 10,400 bolívars per month. A kilogram of meat costs 2,400 bolívars, a kilogram of cheese costs 2,300 bolívars, and a kilogram of flour is 800 bolívars. 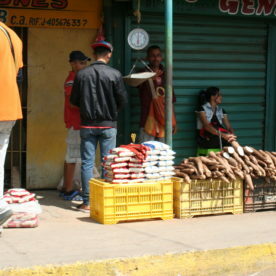 Basic food for a week costs around 6,000 bolívars, and her weekly wages are 2,600 bolívars. She doesn’t have a car; she walks to school. “Teachers are leaving schools in many places. Some schools have to run classes for just three days a week. Despite their low wages, the teachers here are still doing their best, and are even trying to provide a feeding programme for the children. 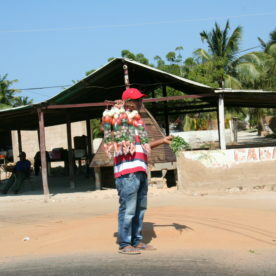 As we travelled to the Sisters’ school in Maracaibo, we drove along the side of a lake, and there were things like rice, fish, flour, and vegetables for sale. It seems that a lot of food has come in from Columbia; this area is very near the border, so there is a lot of smuggling going on, or across-the-border buying and selling. People were standing at the side of the road selling anything and everything – diesel, petrol, oil, even bags of vegetables. These were long, thin plastic bags that would have enough vegetables for one meal, maybe two, and each bag cost half a dollar, or 1,500 bolívars. 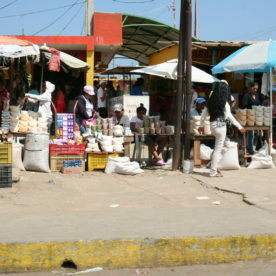 Markets line the roadside on Fr Michael’s journey to the Our Lady of the Sacred Heart School in Maracaibo. In the Sisters’ parish, they had never seen one of the food boxes that the government is supposed to issue to every household each month. The government do support the school feeding programme, but the Sisters want to do more. 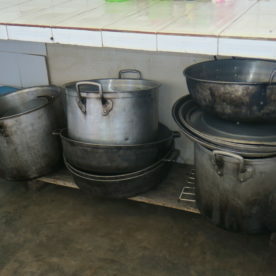 The government are supplying a new kitchen, with cookers and facilities. The Sisters would like to set up a feeding programme to feed 150 children every Saturday, using the school kitchen facilities. 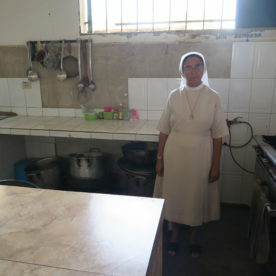 They need USD $300 per month to feed 150 children a week – a total of 600 meals for the children per month. Parishioners would help with the cooking. 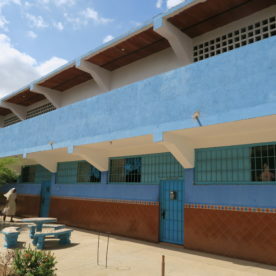 There are new bathrooms in the secondary school, and water filters on the site. They have converted the laboratories into classrooms to accommodate numbers. We donated money to the school for new classrooms, and the contribution meant that an outdoor corridor is now walled in, where before there was a steep drop. 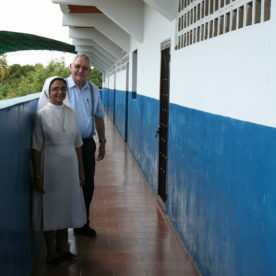 MSC Fr Vincent and OLSH Sr Florinda took Fr Michael on a tour of the school in Maracaibo. The school hall is also used by local church parishes. There are three projects underway in the school at the moment. One is to collect toys for the play area in the preschool. The second is a shoe-making project, where they want to make shoes for the children manually, teaching the children how to do it so they will be equipped to make their own shoes and perhaps be able to sell them. The third project is to provide breakfast. 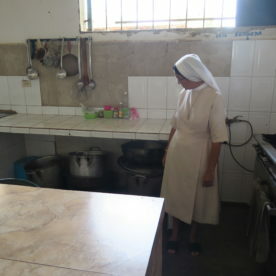 The government do not supply food boxes here, so the Sisters are planning to try to give breakfast to the students. This would encourage more children to come to school; when they’re hungry, they don’t attend school, and so numbers are greatly reduced. Parents would be willing to help in this plan, buying food in Columbia and bringing it to the school. However, for this plan to be undertaken successfully, it would require a large investment – they would have to get cooking utensils, fridges, and security to prevent theft. 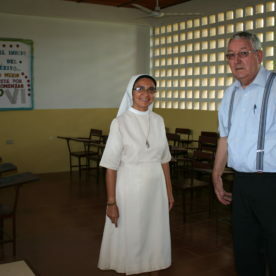 Fr Vincent Screen MSC with students of MSC and OLSH-run schools in Maracaibo.